Last week we talked about speakers in general. This week we are talking about the different types of speakers we might need in a PA system. Horn Speakers reproduce very high frequencies. There are two parts to a Horn Speaker. The horn itself is the visible part that looks a little bit like a giant funnel. The horn driver is bolted onto the back of the horn and actually produces the sound. There are two types of horn driver, Piezo based horns are relatively cheap and compression horns are comparatively more expensive. The only major difference is the volume (measured in dB Sound Pressure Level SPL). Piezo horns cannot produce high SPL and are easily blown while compression drivers are capable of producing ear splitting loud Sound Pressure Levels. Horn speakers are extremely directional so you can only hear the high frequencies where you point the speaker. They also require very little power to produce very high SPL's. Mid range speakers are usually small speakers (from 5" up to 15" in size) that produce the frequencies below those that a horn can efficiently produce and above the frequencies of a Sub Woofer (120Hz upwards). They are usually a traditional speaker design. Mid range speakers are moderately directional and the higher the quality of the speaker cabinet, the more directional the mid range frequencies will be. Mid range speakers require a moderate amount of power to produce high SPL's. Sub Woofers are usually speakers between 12" and 21" in size and are recognisable by their very large magnets. 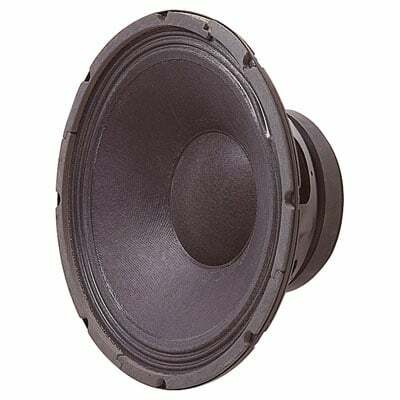 Sub Woofers produce a very low range of frequencies in the bass range from 40Hz up to 200Hz maximum. Even though this is a very small range of frequencies, Sub Woofers require a massive amount of power to move the giant cones through the air. Next week we will look at the different types of speaker cabinet design.